A native of Tokyo, Japan. 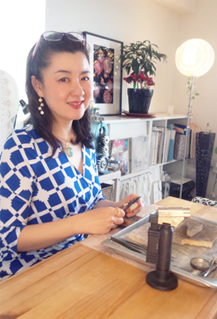 Graduated from Tokyo University of Arts faculty of fine Arts in metal carving,in 1989.While studying, planned various events and became interested in design.After graduation and besides her Jewelry designer's job, she became a producing staff of educational programs at NHK and taught at a private junior high school and high school.Meanwhile traveling worldwide and meeting new people, she discovered herself and explored the various expressions of arts.Her current designs are mainly inspired by the world of plants, spiral-patterned objects and other natural gifts from mother nature.Participated in the planning phase of a US advertising firm. Copyright (C)　MAYUMI YASUGI　All Rights Reserved.